Custom Machined Manifolds Manufactured at ProCam Services LLC. The custom machined aluminum manifolds shown above were manufactured at ProCam Services LLC. and feature a variety of intersecting holes, features that require special tooling, internal NPT threads and engraving. ProCam Services LLC. has machined a wide variety of custom manifolds out of a variety of materials for a variety of industries. 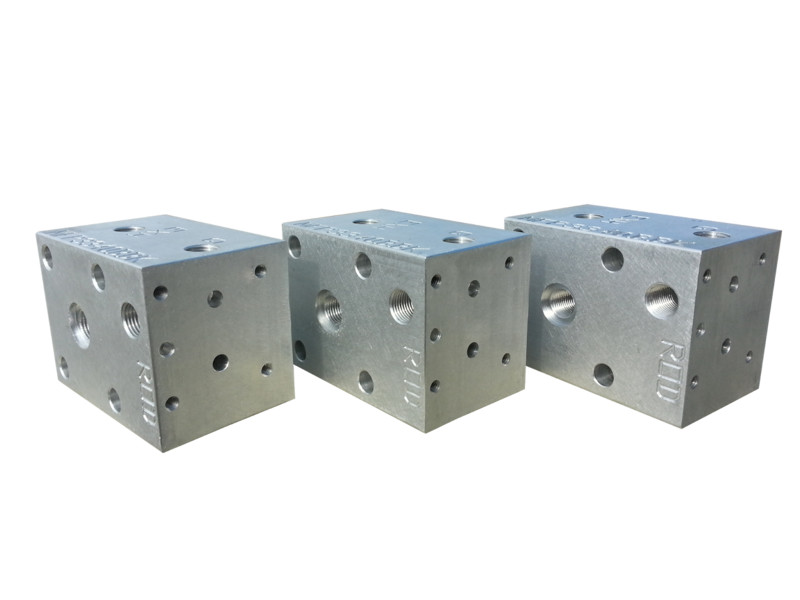 Custom manifold manufacturing presents a unique set of challenges, deburring intersecting holes, deep hole drilling, and features that may require specialized tooling. ProCam Services LLC. 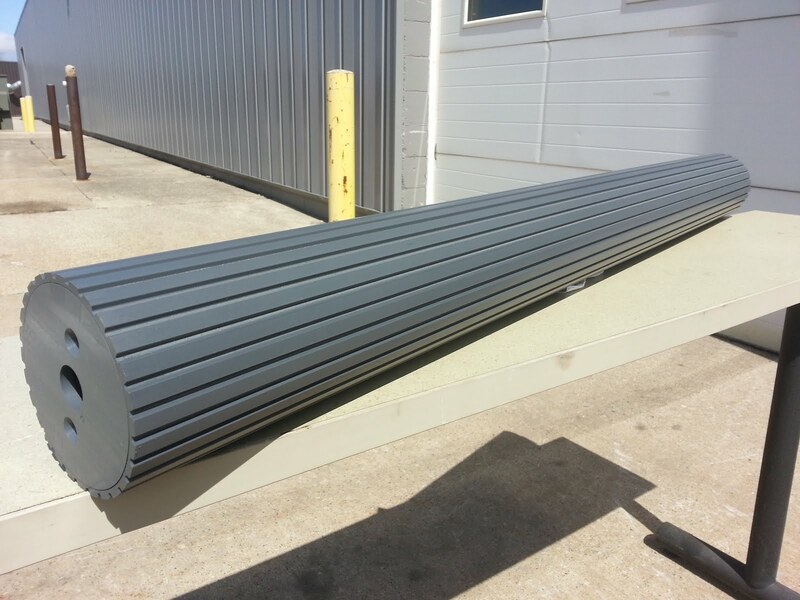 has the experience to handle your custom manifold project. Quantities: Small to large quantities. Sizes: ProCam Services LLC. can manufacture small to large manifolds. 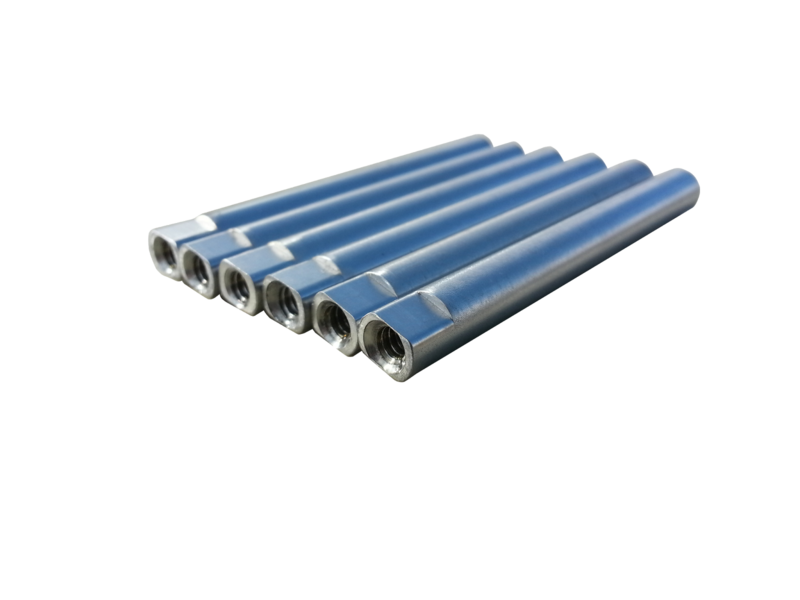 Material: Steel, stainless steel, ductile iron, brass, plastics. Ports: ISO 6149, BSPP, PG, NPS, metric, port spacing, mounting hole specification, mix of port sizes and styles. Industries Served: Rapid prototyping, fluid power, conveyor, engineering, OEM, manufacturing and more! 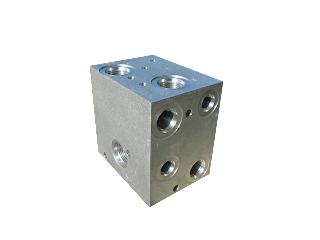 Our advanced CNC milling and machining capabilities, full assembly services, and state of the art CNC services allow us to provide full service machining for manifolds intended for a variety of applications. 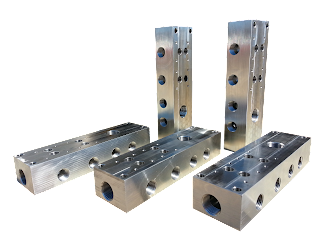 The custom machined aluminum manifolds shown above were manufactured at ProCam Services LLC. 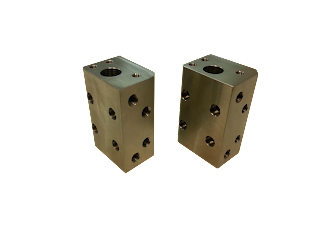 and they feature a variety of intersecting holes, features that require special tooling, internal NPT threads and engraving. The custom machined stainless steel manifolds shown above were machined in small quantities for the OEM industry at ProCam Services LLC. The custom machined stainless steel water manifolds shown above are machined in small quantities for the conveyor and belting industry at ProCam Services LLC. and are made to order and ready to use. Custom/Special Machined Sprockets Manufactured at ProCam Services LLC. The custom machined sprockets shown above were machined at ProCam Services LLC. out of both acetal and UHMW. ProCam Services LLC. 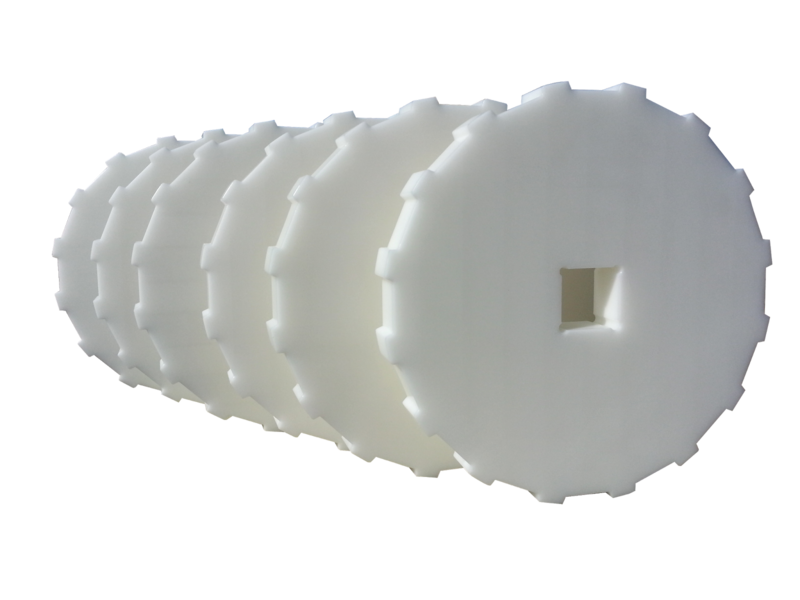 has machined a wide variety of custom sprockets out of acetal, UHMW and PVC for the conveyor industry, belting industry and the specialty machine industry. The custom sprockets that ProCam Services LLC. manufactures are made to order out of virtually any material and for almost any application. 100% CNC machined sprockets resulting in the best concentricity on the market. ProCam Services LLC. sprockets are available in a variety of materials to meet your specific demands, such as acetal, UHMW and PVC for standard applications and other specialty materials for applications requiring greater resistance to abrasion or chemicals. 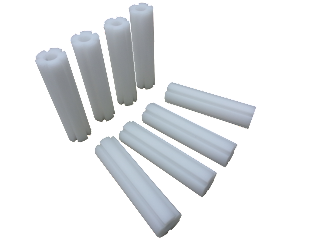 Our customers come back to us for details machined exactly to the print specifications as well as for the good looking and aesthetically pleasing parts we manufacture. We want you to recieve a perfect part that looks exceptionally nice. Many of our parts are used for demonstrations, trade shows or assemblies that demand a high visual appeal. 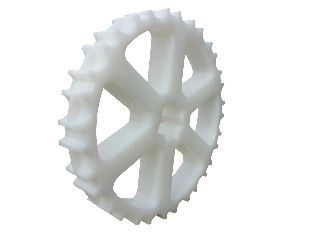 10T 1.5" square bore acetal prototype sprockets shown above was manufactured at ProCam Services LLC. 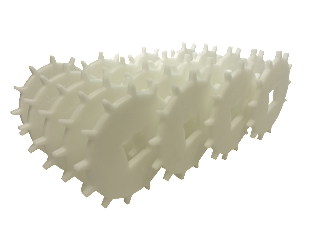 The UHMW special sprocket shown above was machined both internally and externally over 24" of length for a customer in the conveyor industry at ProCam Services LLC. 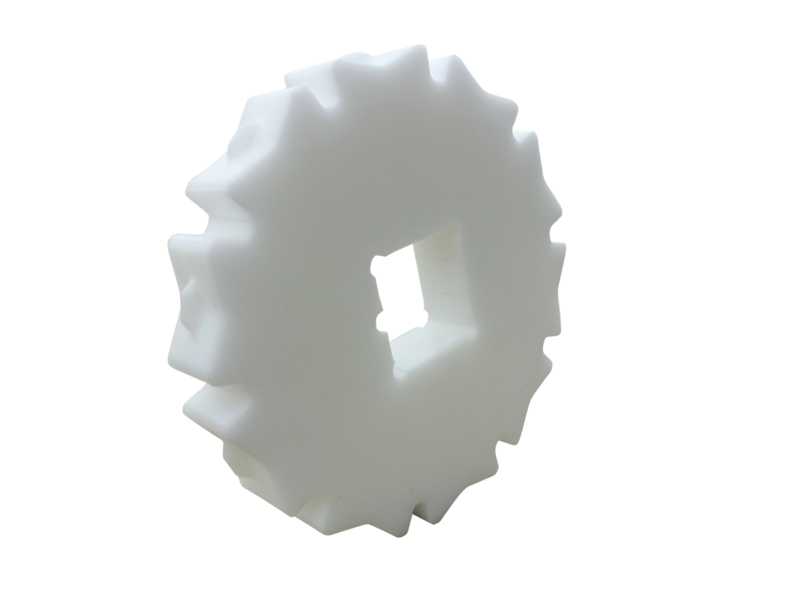 Acetal square bore 10T sprockets shown above were machined at ProCam Services LLC. for the belting industry. The exceptionally small UHMW sprockets shown above were machined at ProCam Services LLC. 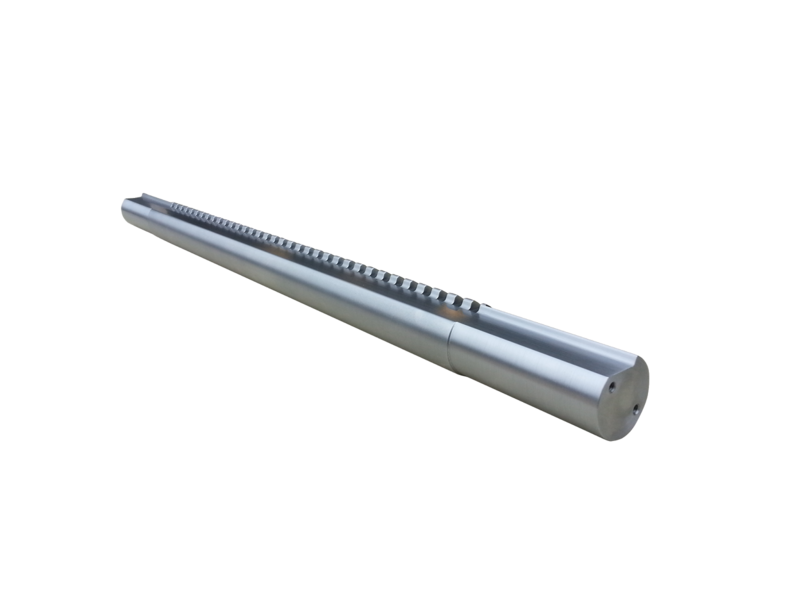 and feature machining on every surface, a .375" diameter through hole over five inches of length, five teeth and an outside diameter smaller than one inch. The 3/8th thick acetal sprockets shown above were machined at ProCam Services LLC. for the belting industry. The special acetal sprocket shown above was machined in low volumes at ProCam Services LLC. for the belting industry. Pictured above is a 50" long special roller machined for the food/conveyor industry at Pro-Cam Services LLC. Custom Machined Shafts At ProCam Services LLC. The precision stainless steel drive shafts shown above were turned and milled at ProCam Services LLC. 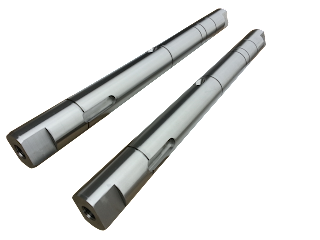 These shafts feature many tolerances of +.000/-.001, an exceptionally long through hole, deep threading, an intersecting hole milled on a 45 degree angle, snap ring grooves, corresponding keyways machined exactly 180 degrees from each other, flats milled on both ends and the outer diameter turned down to 40mm +/- .001 over 17" of length. The custom stainless steel dowel pins shown above were turned and milled at ProCam Services LLC. These custom machined components were machined with tolerances of +/- .001 for special machinery designed and built for the OEM industry. 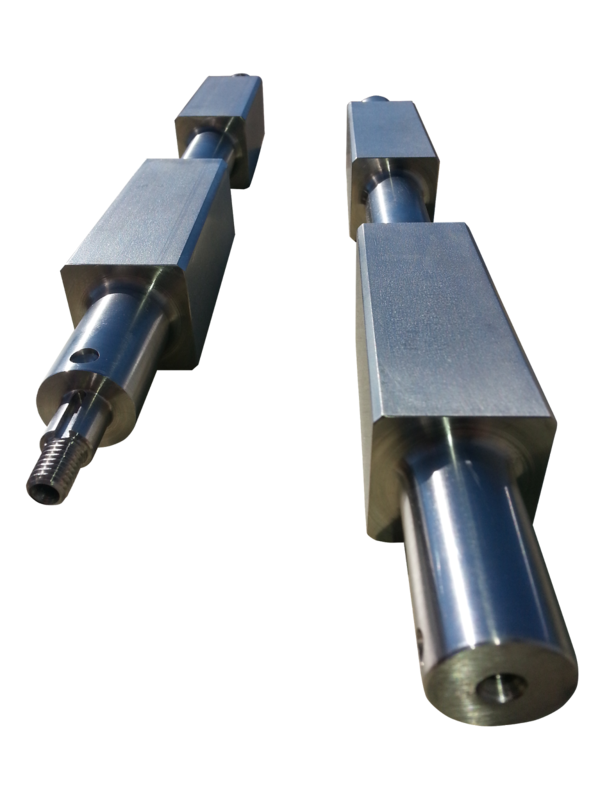 The custom machined square shafts manufactured at ProCam Services LLC. shown above feature tight tolerances, external threads and a keyway. The special 40mm shaft machined at ProCam Services LLC. 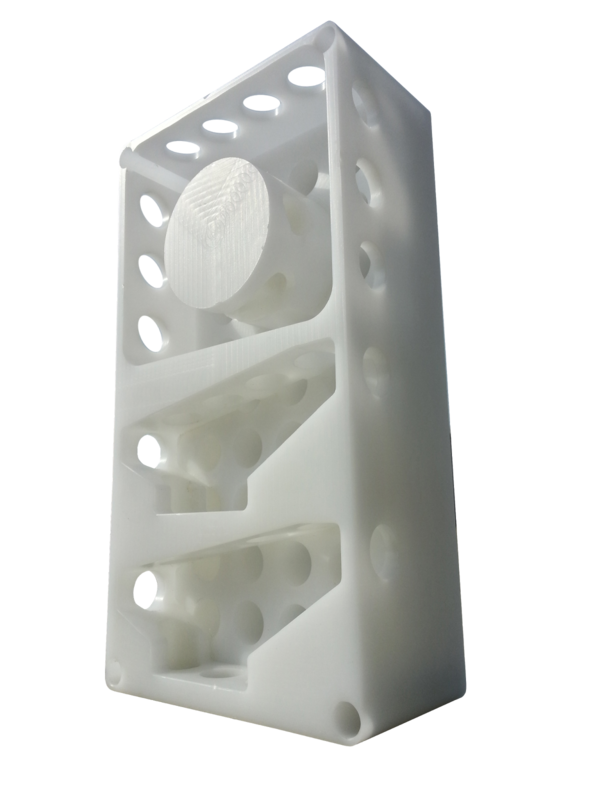 shown above was turned and milled on the CNC lathes and CNC mill, it features tight tolerances, over twenty milled teeth and drilled and tapped holes on the ends. 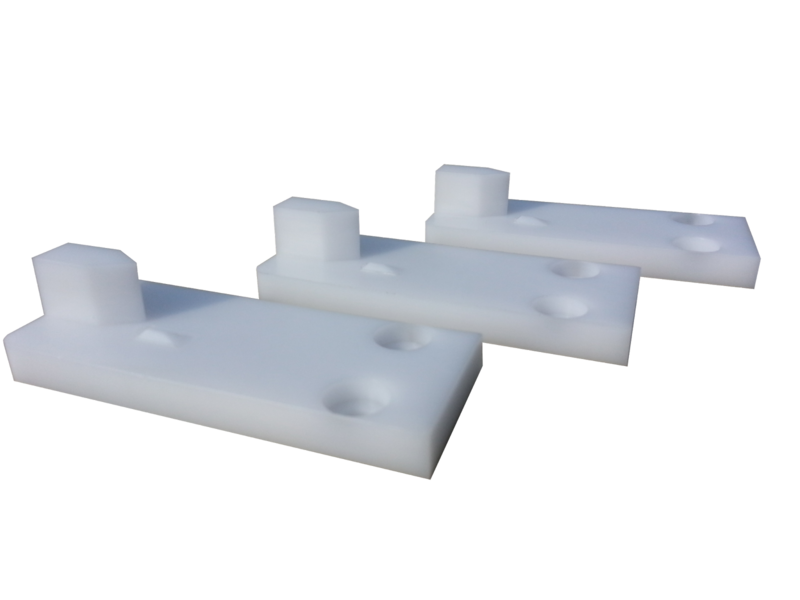 Acetal Details Machined At ProCam Services LLC. ProCam Services LLC. machines a variety of acetal details for its customers. 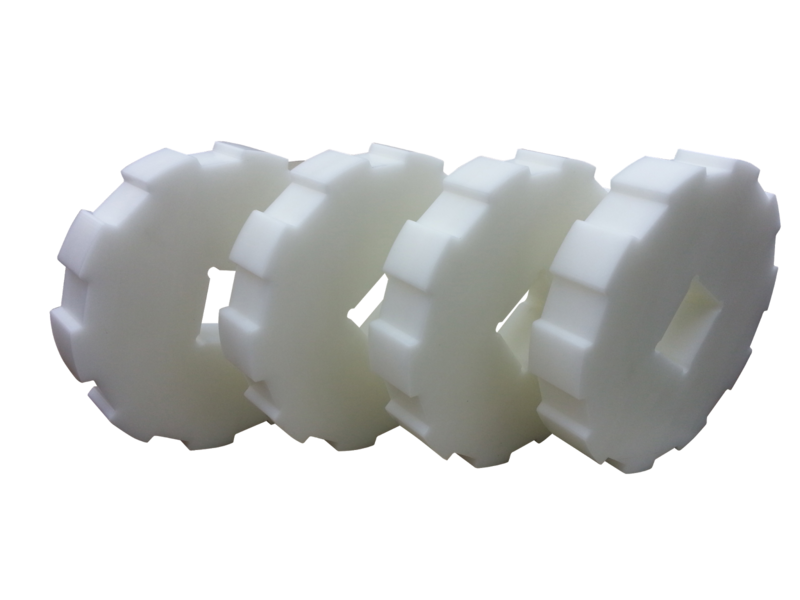 Acetal is used frequently in a self lubricating bearing surfaces, slide type applications and food grade applications. Extremely low water absorption makes this a perfect material for valves, seats and moving parts in water filled areas (many white valve parts in toilet tanks are made of Acetal). 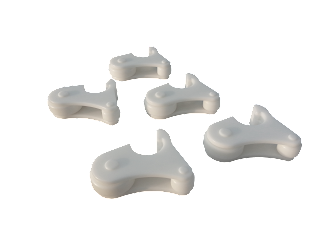 Crisp machining and tight tolerances are easily obtainable with acetal and a variety of shapes, sizes and colors are available. 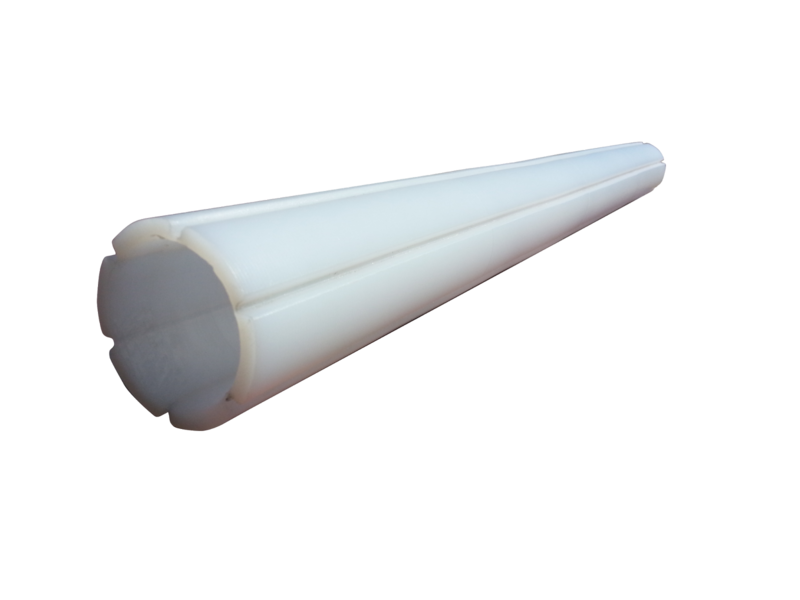 The acetal fixture shown above was machined in multiple set-ups at ProCam Services LLC. and features over forty intersecting holes. 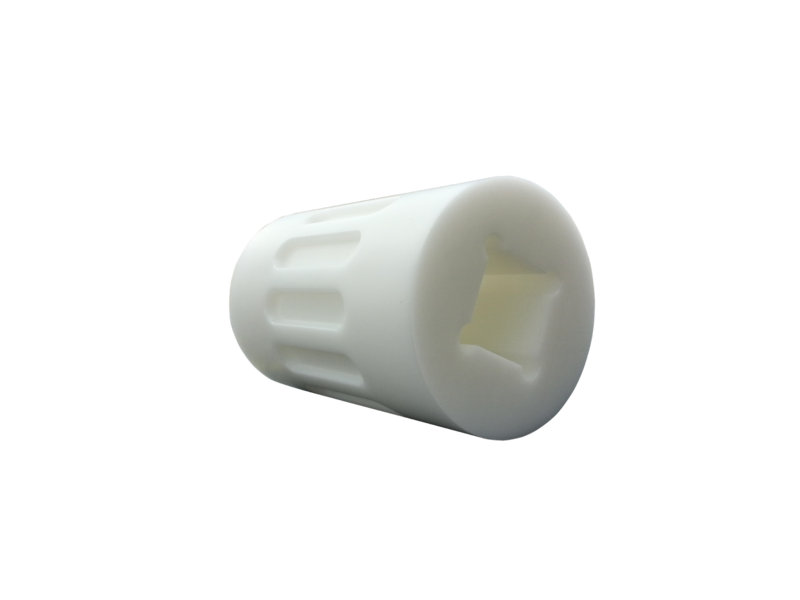 The prototype acetal details shown above were machined at ProCam Services LLC. in two operations for the food grade conveyor industry. The acetal assemblies shown above feature four mating parts machined on both the CNC Lathes and CNC Mills and were manufactured to tight tolerances at ProCam Services LLC. The acetal edge cutting details shown above were machined in two operations at ProCam Services LLC. 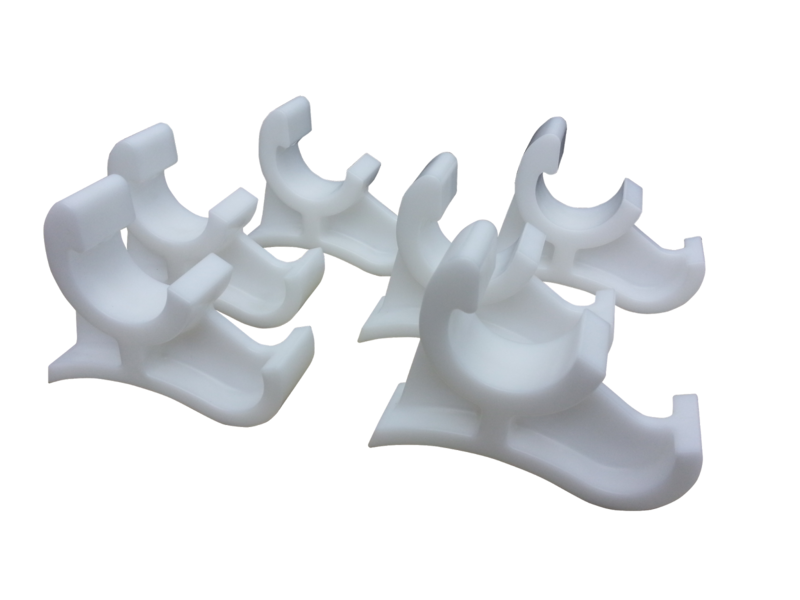 , they feature 3D machining and were manufactured and delivered in less than one day for an expedite order.